Outconsumer has posted a couple of NBA 2K18 videos. (These are in Spanish). One of them shows off MyTEAM and a game between the ’06-’07 Golden State Warriors and ’01-’02 Sacramento Kings with Chris Webber. The other video highlights the many options available in MyCAREER mode. Loving all the coverage the game is getting. Kinda feelin' that Statement Thunder jersey. Good to see some nicer quality vids though. Nah it's definitely not supposed to be baby blue lol. Their jerseys are the darkest they've ever been this year. 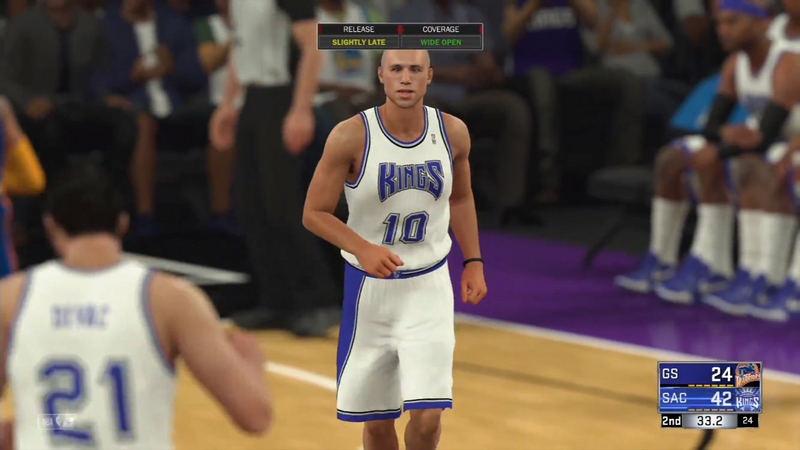 Those look like the throwback jerseys that 2K has never fixed. I don't recall Detroit ever being baby blue. Ok I am officially happy with the banks not always swishing now. IMO it's balanced enough to not be considered a thing anymore. Happy with that (I am a sucker for rim/net physics) :). No joke. These dudes are terrible. Makes it hard to watch and even harder to judge. If it helps (Goffs being one I'm sure) - it switches to what I believe is the new broadcast zoom camera Mike has mentioned on Twitter at ~ 13 minute mark. Don't think those are this year's jerseys. Didn't see a Nike logo on the shoulder. I wonder what broadcast cam that was towards the end of the video. I was liking it. Don't want to get ahead of myself but based on all the videos the movement does look alot freer. Looks like there is more control and less animations taking over movement. Hopefully the game feels as good as it looks. That's almost as bad for me as the ability of those playing. I don't know how y'all play on broadcast. You get used to it - possibly because I grew up playing on it. Plus IMO it just looks 1000 times better (like a real TV broadcast) - which adds to my enjoyment. When watching someone else play, I lose care factor for the practicality of 2K cam (as it is all about me in this instance hahaha :)). certain graphical things look better, but it doesn't seem so different. They are still throwing those wrist flick laser passes, and animations on catch and shoot go way too fast, as well as burst speed seems way too fast. Of course, I'm the only one who is bothered by that stuff. It really looks unrealistic now after not having played 2k for some months, after watching the NBA Finals and all without the taint of video games. That finger roll layup animation keeps coming up. Seems like it's the "go-to" one this year, so most standard layups will end up being that one. 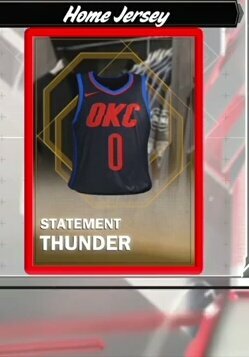 Idk is anyone caught it, but one of OKC's alternate jerseys was revealed in the video as well. Holy cow. If I ever get into MyTeam, I'm grabbing Giannis. My dude was flying up and down the court, lol. The game definitely looks a lot more free flowing, which is a good thing. Haha to each his own and I get the appeal. My depth perception would be so off. Noticed the Warriors Roster had mostly generic players on it. Looks similar to last year but it looks like they scrapped the right stick navigation. I don't think I've seen one pick and roll in all of these videos..
That forced strip animation was terrible. Took charge against LeBron and the game had me do this and strip him and get a foul called against me. Note: The reason why I'm looking at the defense so closely this year is because NBA2k17 was the easiest to score on HOF and I've never really ever played on HOF legitimately in the past. I have always stuck with veteran and allstar. Please keep the following in mind: I did run a test on rookie vs hall of fame isolation on 2k14 and the defensive positioning and coverage still recognized the need to clamp the paint when the driver got into the paint for both difficulty levels. First play of the video. I know sometimes you do want to stay home with your assignments but in a situation where a player has a direct line to the basket, is the following proper defense? Was that play suppose to replicate those open lanes (i.e. JR Smith running away from the paint) for Kevin Durant dunking in the finals? Another scenario where I am trying very hard to try to see where this "awareness" is that they've mentioned. 2k18 Giannis driving the paint without resistance. People are going to say it's most likely on rookie, but hypothetically, should that really happen on rookie. Wouldn't it be more worked to dumb down the cpu ai rather than just make the shot success higher while the paint is still clamped. Personally I'm never the one to really get amp about player body parts morphing through other players, and I still don't if it doesn't really affect the outcome. Is it just me or am I seeing a lot more morphing this year without even having to go into replay mode. Two things with the following gif. Don't really like how they all have their heads down while driving the paint. Not even looking at where they're going. Second this is the morph. You're talking about the clipping issues? Saw some of those in the Bulls vs Piston vid also. One where the ball went through Jordans leg. Which says a lot about ball tangibility. But equally, need to know what build these vids are. If from the team up event (Bulls/Pistons one) then it would be fairly old I guess. Clipping issues could be the sort of thing that gets fixed when the game is getting "polished". I'm thinking this is from that press showing weeks ago. We have no idea how old the build is....the newer vids kinda shows the gameplay a bit better. The moment I saw that camera angle I stopped watching! Thanks for the share Steve. Ok --- What has happened to the uniforms in this game? The detail has appeared to have disappeared completely, unless you get player close-up's. Even in that slow-mo Greek Freak slow-mo at the beginning, it's just flat, pastel-like colors. Is it just me, or are they starting to look like last-gen textures? Is it all of the cloth physics cutting into the game engine's resources??? I'm on the same boat. Screenshots look amazing but something about the 5v5 action makes the game look washed out. I'm going to go ahead and assume this is on a lower difficulty setting. What gives it away is that shots are falling much more than they did in the all time Chicago vs Detroit video posted by Brian Mazique. In that video he stated that he was playing on superstar. The A.I also looks much more stripped down than it did in Brian's video, So I wouldn't look much into the flaws seen in this video. Can't help but have some thoughts about this..... something just a bit lower in quality about the one on the left. I noticed the graphics were extremely off for some of the Classic teams. 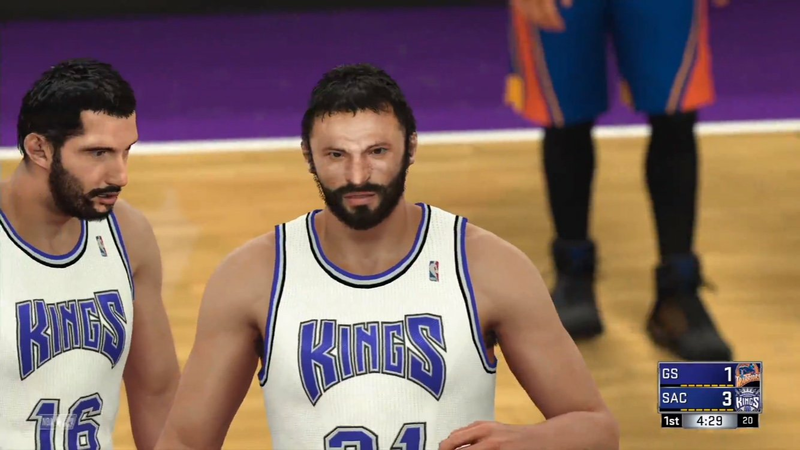 Like the Kings were completely messed up (Peja I think it was?). The game looks pretty fluid for me, but I really hope that the gameplay was on Rookie, because the defense was horrid. Also, the graphics look a bit "cartoonish" or as lower quality compared to screenshots. Yeah I'm thinking this also (see my previous Hayward pic post). 2k18 console vs 2k18 PC is my only thought at this point. Hoping I am 100% wrong. Interesting thought - could very well be it. 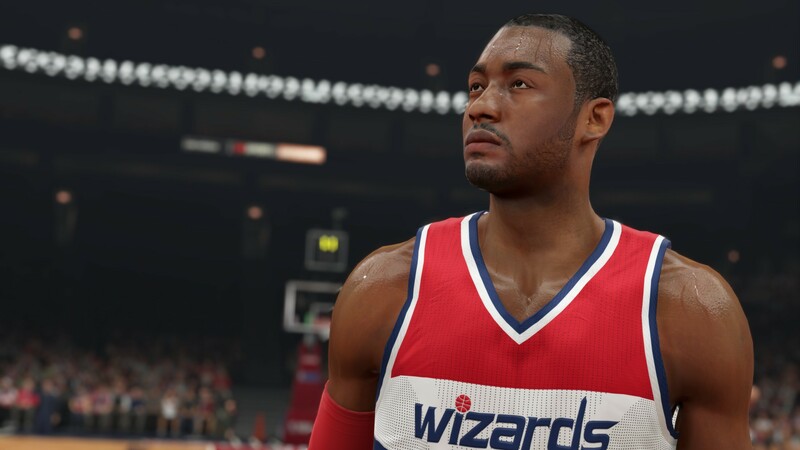 Now you have me thinking about when they released hi-res Harden and John Wall pics from a PC for 2K15. Specifically from a PC - I remember reading that vividly. Remember this pic? It would make sense that 2K would do this - especially if they've done it in the past. Wouldn't surprise me if 2k used some way to make players seem more detailed than they actually look, since 90% of the game world does it. Some of the images released of games makes it seem like reality and it has never looked like that when you play it. Hmm.... that's new to me I must admit. uploaded in 1080p instead of 4k , YouTube compression , no HDR. Yeah need to know if they were playing on a PS4 Pro, but it doesnt matter if they captured at 1080p, then compressed it again during rendering and compressed again in youtube. I feel at ease with these comments about upload, compression etc. Totally didn't occur to me. Thanks for the wake up though - I'll exhale now haha. Also some of the 2K screenshots are purposely captured up close in 4K during opening scenes with all the cool lighting. That Hayward comparison probably isn't the best example because you lose image quality from cropping an already compressed lower resolution image. Once we get the game we'll know the deal. Damn wish I had the money for a PS4 pro and a quality 4k tv. Just not a reasonable investment right now. Hope they game at least looks better than 2k17 on a standard PS4. and playing at a slower pace. These games always look bad depending on how they're played. WHY DONCHA RUB IT IN! I'm still good with my tv but I would like a PS4 PRO just for the framerate boost. I'm hesitant on ordering because with my luck Sony will announce a new version of Pro SLIM. gameplay looks so amazing i'm so excited. Damn, @ 8:55 is why you'll only catch me on Broadcast cams.. The colors are definitely bad in the retro jerseys, for sure. But you see the same no detail textures in the current uniforms, like in the video with the Celtics and Kyrie. I mean, I see little to no detail -- it's not a stretch to relate it to O.G. Xbox/PS2 level textures of the uni's. Thank god the resolution is high to eliminate jaggies, at least. But the graphics have taken a definite nosedive since 2K14, jumping from next-gen graphics down to last-gen. The 07' Warriors have a 91 overall rating? LOL stop it. How in the world with a team of only 6 total players would they even sniff a 91 Overall. The coach grades I bet are inflated again this year. Sadly last year the Defense/Offense were backwards due to a glitch. This year it looks like the grades were not even touched for any of the current teams. Hopefully that will be rectified quickly by roster makers. They definitely shouldn't be rated as high as a 91 in the game, but your recollection of that second round series being awful, they weren't too bad against that very good Jazz team that year. They took a game from them on their home court by 20 points, and of their four losses, two of them were close with one game ended in OT. The other two losses -- while soundly beaten -- were merely by 13 and 14 points respectively.